This guide contains important planning information and describes the configuration procedures for SR-IOV and OVS-DPDK in your Red Hat OpenStack Platform with NFV deployment. Red Hat OpenStack Platform provides the foundation to build a private or public cloud on top of Red Hat Enterprise Linux. It offers a massively scalable, fault-tolerant platform for the development of cloud-enabled workloads. This guide describes the steps to plan and configure SR-IOV and Open vSwitch with DPDK data path (OVS-DPDK) using the Red Hat OpenStack Platform director for NFV deployments. Network Functions Virtualization (NFV) is a software solution that virtualizes a network function on general purpose, cloud-based infrastructure. NFV allows the Communication Service Provider to move away from traditional hardware. For a high-level overview of the NFV concepts, see the Network Functions Virtualization Product Guide. OVS-DPDK and SR-IOV configuration depends on your hardware and topology. This guide provides examples for CPU assignments, memory allocation, and NIC configurations that may vary from your topology and use case. This file contains network details, subnets, and IP address ranges for the overcloud nodes. This file also contains settings that override the default parameter values for various scenarios. These files contain the host network interface configuration for the overcloud nodes. This file replaces the deprecated first-boot.yaml file, and contains configuration for host installation. These Heat template files are located at /usr/share/openstack-tripleo-heat-templates/ on the undercloud node. The following sections provide more details on how to plan and configure the Heat template files for NFV using the Red Hat OpenStack Platform director. NFV configuration makes use of YAML files. See YAML in a Nutshell for an introduction to the YAML file format. This section describes the hardware details necessary for NFV. You can use Red Hat Technologies Ecosystem to check for a list of certified hardware, software, cloud providers, and components. Choose the category and select the product version. For a complete list of the certified hardware for Red Hat OpenStack Platform, see Red Hat OpenStack Platform certified hardware. For a list of tested NICs for NFV, see Network Adapter Support. Customer Portal login required. Enable hardware introspection to retrieve this information from bare-metal nodes. Log onto each bare-metal node to manually collect the information. You must install and configure the undercloud before you can retrieve NUMA information through hardware introspection. See the Director Installation and Usage Guide for details. The Bare Metal service hardware inspection extras (inspection_extras) is enabled by default to retrieve hardware details. You can use these hardware details to configure your overcloud. See Configuring the Director for details on the inspection_extras parameter in the undercloud.conf file. Use the openstack baremetal introspection data save _UUID_ | jq .numa_topology command to retrieve this information, with the UUID of the bare-metal node. C3 Power State - Disabled. C6 Power State - Disabled. MLC Spacial Prefetcher - Enabled. DCU Data Prefetcher - Enabled. CPU Power and Performance - Performance. Memory RAS and Performance Config → NUMA Optimized - Enabled. This section describes the supported configurations and drivers, and subscription details necessary for NFV. To install Red Hat OpenStack Platform, you must register Red Hat OpenStack Platform director using the Red Hat Subscription Manager, and subscribe to the required channels. See Registering your system for details. Register your system with the Content Delivery Network, entering your Customer Portal user name and password when prompted. Locate the Pool ID value and attach the Red Hat OpenStack Platform 14 entitlement. Enable only the repositories required for Red Hat OpenStack Platform with NFV. Perform an update on your system to make sure you have the latest base system packages. To register your overcloud nodes, see Ansible Based Registration. Red Hat’s embedded OpenDaylight SDN solution is being deprecated in OpenStack Platform (OSP) 14. Red Hat will continue to provide support and bug fixes for OpenDaylight, with all support ending with the OSP 13 lifecycle (June 27, 2021). For a complete list of supported drivers, see Component, Plug-In, and Driver Support in Red Hat OpenStack Platform . For a list of NICs tested for NFV deployments with Red Hat OpenStack, see Tested NICs. For a complete list of products and services tested, supported, and certified to perform with Red Hat technologies (Red Hat OpenStack Platform), see Third Party Software compatible with Red Hat OpenStack Platform. You can filter the list by product version and software category. For a complete list of products and services tested, supported, and certified to perform with Red Hat technologies (Red Hat Enterprise Linux), see Third Party Software compatible with Red Hat Enterprise Linux. You can filter the list by product version and software category. Provisioning network - Provides DHCP and PXE boot functions to help discover bare-metal systems for use in the overcloud. External network - A separate network for remote connectivity to all nodes. The interface connecting to this network requires a routable IP address, either defined statically or dynamically through an external DHCP service. Single NIC configuration - One NIC for the provisioning network on the native VLAN and tagged VLANs that use subnets for the different overcloud network types. Dual NIC configuration - One NIC for the provisioning network and the other NIC for the external network. Dual NIC configuration - One NIC for the provisioning network on the native VLAN and the other NIC for tagged VLANs that use subnets for the different overcloud network types. Multiple NIC configuration - Each NIC uses a subnet for a different overcloud network type. For more information on the networking requirements, see Networking requirements. To optimize your SR-IOV deployment for NFV, you will set the individual parameters based on your Compute node hardware. See Discovering your NUMA node topology to evaluate your hardware impact on the SR-IOV parameters. To achieve high performance with SR-IOV, partition the resources between the host and the guest. A typical topology includes 14 cores per NUMA node on dual socket Compute nodes. Both hyper-threading (HT) and non-HT cores are supported. Each core has two sibling threads. One core is dedicated to the host on each NUMA node. The VNF handles the SR-IOV interface bonding. All the interrupt requests (IRQs) are routed on the host cores. The VNF cores are dedicated to the VNFs. They provide isolation from other VNFs and isolation from the host. Each VNF must use resources on a single NUMA node. 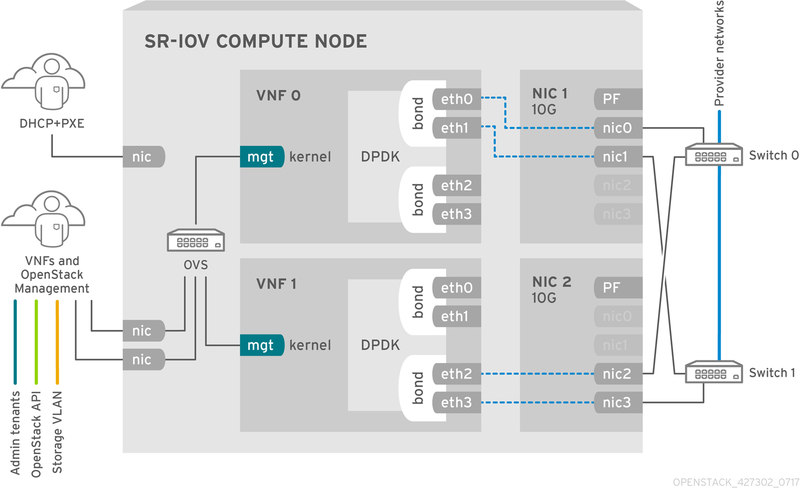 The SR-IOV NICs used by the VNF must also be associated with that same NUMA node. This topology does not have a virtualization overhead. The host, OpenStack Networking (neutron), and Compute (nova) configuration parameters are exposed in a single file for ease, consistency, and to avoid incoherence that is fatal to proper isolation, causing preemption and packet loss. The host and virtual machine isolation depend on a tuned profile, which takes care of the boot parameters and any OpenStack modifications based on the list of CPUs to isolate. The following image has two VNFs each with the management interface represented by mgt and the data plane interfaces. The management interface manages the ssh access and so on. The data plane interfaces bond the VNFs to DPDK to ensure high availability (VNFs bond the data plane interfaces using the DPDK library). The image also has two redundant provider networks. The Compute node has two regular NICs bonded together and shared between the VNF management and the Red Hat OpenStack Platform API management. The image shows a VNF that leverages DPDK at an application level and has access to SR-IOV VF/PFs, together for better availability or performance, depending on the fabric configuration. DPDK improves performance, while the VF/PF DPDK bonds provide support for failover (availability). The VNF vendor must ensure their DPDK PMD driver supports the SR-IOV card that is being exposed as a VF/PF. The management network uses OVS so the VNF sees a “mgmt” network device using the standard virtIO drivers. 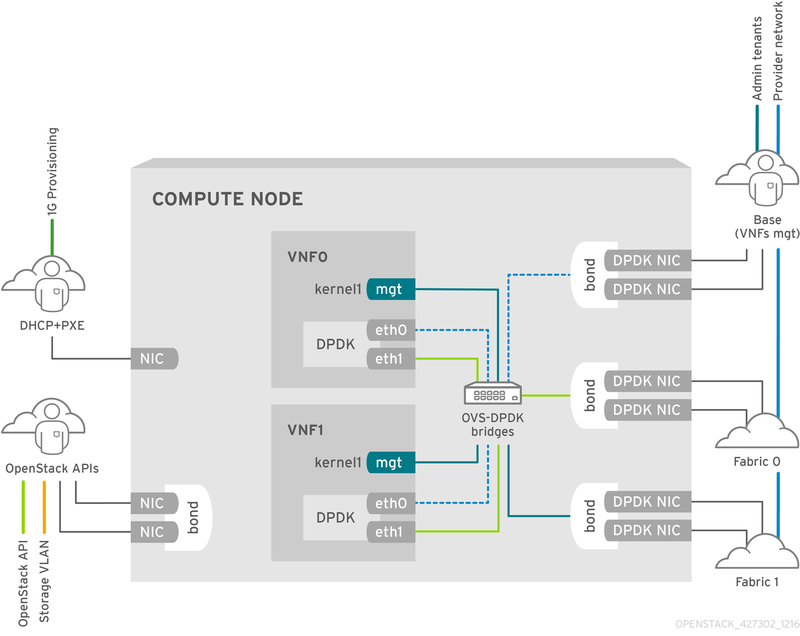 Operators can use that device to initially connect to the VNF and ensure that their DPDK application bonds properly the two VF/PFs. The following image shows the topology for SR-IOV without HCI for the NFV use case. It consists of Compute and Controller nodes with 1 Gbps NICs, and the Director node. Special considerations may be needed for networking performance beyond what is possible through virtual networking. SR-IOV allows near bare metal performance by allowing instances from OpenStack direct access to a shared PCIe resource through virtual resources. Install and configure the undercloud before deploying the overcloud. See the Director Installation and Usage Guide for details. Do not manually edit values in /etc/tuned/cpu-partitioning-variables.conf that are modified by Director heat templates. The CPU assignments, memory allocation and NIC configurations of the following examples may differ from your topoology and use case. Generate the built-in ComputeSriov to define nodes in the OpenStack cluster that will run NeutronSriovAgent, NeutronSriovHostConfig and default compute services. Include the neutron-sriov.yaml and roles_data.yaml files when generating overcloud_images.yaml so that SR-IOV containers are prepared. For more information on container image preparation, see Director Installation and Usage. To apply the KernelAgs and TunedProfile parameters, include the host-config-and-reboot.yaml file from /usr/share/openstack-tripleo-heat-templates/environments to your deployment script. Configure the parameters for the SR-IOV nodes under parameter_defaults in accordance with the needs of your cluster, and the configuration of your hardware. These settings are typically added to the network-environment.yaml file. In the same file, configure role specific parameters for SR-IOV compute nodes. KernelArgs: "default_hugepagesz=1GB hugepagesz=1G hugepages=32 iommu=pt intel_iommu=on isolcpus=1-19,21-39"
A Mellanox network interface cannot be configured as a nic-config interface type ‘vlan’, as tunnel endpoints such as VXLAN will not pass traffic due to driver limitations. Use a Mellanox port with nic-config interface type ‘interface’ only. Ensure that the list of default filters includes the value AggregateInstanceExtraSpecsFilter. The following procedures describe additional settings that will be needed to configure OVS hardware offload. Configuring SR-IOV with OVS hardware offload does not require changes to the network configuration templates. As of Red Hat OpenStack Platform 14, OVS hardware offload is a Technology Preview and not recommended for production deployments. For more information about Technology Preview features, see Scope of Coverage Details. To enable OpenvSwitch (OVS) hardware offload in the ComputeSriov role, complete these steps. Add the ovs-hw-offload.yaml environmnet file from /usr/share/openstack-tripleo-heat-templates/environments to be included in your deployment script. This is in addition to host-config-and-reboot.yaml environment file noted in Configuring SR-IOV. Append the switchdev option to the NeutronSriovNumVFs parameters that will be configured for OVS hardware offload. Confirm that a pci device has its mode configured as switchdev. Confirm offload is enabled in OVS. It is recommended to use host aggregates to separate high performance compute hosts. For information on creating host aggregates and associated flavors for scheduling see Creating host aggregates. You should use host aggregates to separate CPU pinned instances from unpinned instances. Instances that do not use CPU pinning do not respect the resourcing requirements of instances that use CPU pinning. Use vnic-type direct to create an SR-IOV VF port. Use vnic-type direct-physical to create an SR-IOV PF port. It is recommended to deploy guests using cpu pinning and hugepages for increased performance. You can schedule high performance instances on a subset of hosts by matching aggregate metadata with flavor metadata. Ensure that the AggregateInstanceExtraSpecFilter value is added to the scheduler_default_filters parameter in the nova.conf configuration file. If you add AggregateInstanceExtraSpecFilter to satisfy this requirement, restart the nova container. Create an aggregate group for SR-IOV, and add relevant hosts. Define metadata, for example, sriov=true, that matches defined flavor metadata. Set additional flavor properties. Note that the defined metadata, sriov=true, matches the defined metadata on the SR-IOV aggregate. 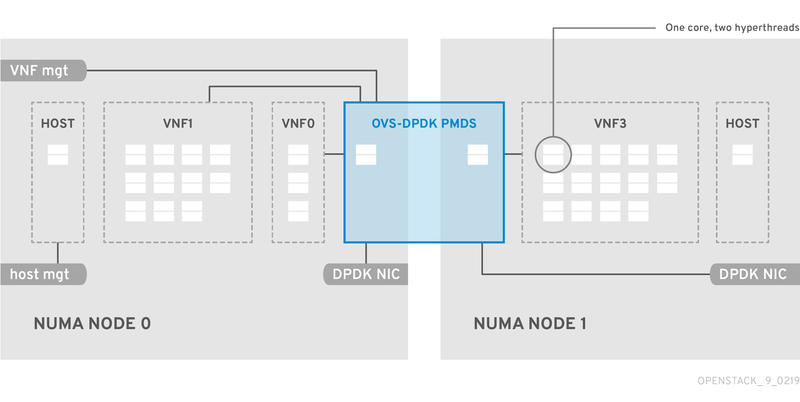 To optimize your OVS-DPDK deployment for NFV, you must understand how OVS-DPDK uses the Compute node hardware (CPU, NUMA nodes, memory, NICs) and the considerations for determining the individual OVS-DPDK parameters based on your Compute node. See NFV performance considerations for a high-level introduction to CPUs and NUMA topology. OVS-DPDK partitions the hardware resources for host, guests, and OVS-DPDK. The OVS-DPDK Poll Mode Drivers (PMDs) run DPDK active loops, which require dedicated cores. This means a list of CPUs and Huge Pages are dedicated to OVS-DPDK. A sample partitioning includes 16 cores per NUMA node on dual socket Compute nodes. The traffic requires additional NICs since the NICs cannot be shared between the host and OVS-DPDK. DPDK PMD threads must be reserved on both NUMA nodes even if a NUMA node does not have an associated DPDK NIC. OVS-DPDK performance also depends on reserving a block of memory local to the NUMA node. Use NICs associated with the same NUMA node that you use for memory and CPU pinning. Ensure that both interfaces in a bond are from NICs on the same NUMA node. You can use the OpenStack Workflow (mistral) service to derive parameters based on the capabilities of your available bare-metal nodes. OpenStack workflows use a .yaml file to define a set of tasks and actions to perform. You can use a pre-defined workbook, derive_params.yaml, in the tripleo-common/workbooks/ directory. This workbook provides workflows to derive each supported parameter from the results retrieved from Bare Metal introspection. The derive_params.yaml workflows use the formulas from tripleo-common/workbooks/derive_params_formulas.yaml to calculate the derived parameters. You can modify the formulas in derive_params_formulas.yaml to suit your environment. The derive_params.yaml workbook assumes all nodes for a given composable role have the same hardware specifications. The workflow considers the flavor-profile association and nova placement scheduler to match nodes associated with a role and uses the introspection data from the first node that matches the role. See Troubleshooting Workflows and Executions for details on OpenStack workflows. You can use the -p or --plan-environment-file option to add a custom plan_environment.yaml file to the openstack overcloud deploy command. The custom plan_environment.yaml file provides the list of workbooks and any input values to pass into the workbook. The triggered workflows merge the derived parameters back into the custom plan_environment.yaml, where they are available for the overcloud deployment. You can use these derived parameter results to prepare your overcloud images. See Plan Environment Metadata for details on how to use the --plan-environment-file option in your deployment. The workflows in derive_params.yaml derive the DPDK parameters associated with the matching role that uses the ComputeNeutronOvsDpdk service. The OvsDpdkMemoryChannels parameter cannot be derived from the introspection memory bank data since the format of memory slot names are not consistent across different hardware environments. In most cases, OvsDpdkMemoryChannels should be 4 (default). Use your hardware manual to determine the number of memory channels per socket and use this value to override the default. See Section 8.1, “Deriving DPDK parameters with workflows” for configuration details. This section describes how OVS-DPDK uses parameters within the director network_environment.yaml HEAT templates to configure the CPU and memory for optimum performance. Use this information to evaluate the hardware support on your Compute nodes and how best to partition that hardware to optimize your OVS-DPDK deployment. Always pair CPU sibling threads (logical CPUs) together for the physical core when allocating CPU cores. See Discovering your NUMA node topology to determine the CPU and NUMA nodes on your Compute nodes. You use this information to map CPU and other parameters to support the host, guest instance, and OVS-DPDK process needs. Provides the CPU cores that are used for the DPDK poll mode drivers (PMD). Choose CPU cores that are associated with the local NUMA nodes of the DPDK interfaces. OvsPmdCoreList is used for the pmd-cpu-mask value in Open vSwitch. Pair the sibling threads together. Avoid allocating the logical CPUs (both thread siblings) of the first physical core on both NUMA nodes as these should be used for the OvsDpdkCoreList parameter. Performance depends on the number of physical cores allocated for this PMD Core list. On the NUMA node which is associated with DPDK NIC, allocate the required cores. Determine the number of physical cores required based on the performance requirement and include all the sibling threads (logical CPUs) for each physical core. Allocate the sibling threads (logical CPUs) of one physical core (excluding the first physical core of the NUMA node). You need a minimal DPDK poll mode driver on the NUMA node even without DPDK NICs present to avoid failures in creating guest instances. Sets cores for CPU pinning. The Compute node uses these cores for guest instances. NovaVcpuPinSet is used as the vcpu_pin_set value in the nova.conf file. Exclude all cores from the OvsPmdCoreList and the OvsDpdkCoreList. A set of CPU cores isolated from the host processes. This parameter is used as the isolated_cores value in the cpu-partitioning-variable.conf file for the tuned-profiles-cpu-partitioning component. Match the list of cores in OvsPmdCoreList and NovaVcpuPinSet. Provides CPU cores for non data path OVS-DPDK processes, such as handler and revalidator threads. This parameter has no impact on overall data path performance on multi-NUMA node hardware. This parameter is used for the dpdk-lcore-mask value in Open vSwitch, and these cores are shared with the host. Allocate the first physical core (and sibling thread) from each NUMA node (even if the NUMA node has no associated DPDK NIC). These cores must be mutually exclusive from the list of cores in OvsPmdCoreList and NovaVcpuPinSet. Maps memory channels in the CPU per NUMA node. The OvsDpdkMemoryChannels parameter is used by Open vSwitch as the other_config:dpdk-extra=”-n <value>” value. Use dmidecode -t memory or your hardware manual to determine the number of memory channels available. Use ls /sys/devices/system/node/node* -d to determine the number of NUMA nodes. Divide the number of memory channels available by the number of NUMA nodes. Reserves memory in MB for tasks on the host. This value is used by the Compute node as the reserved_host_memory_mb value in nova.conf. Use the static recommended value of 4096 MB. Specifies the amount of memory in MB to pre-allocate from the hugepage pool, per NUMA node. This value is used by Open vSwitch as the other_config:dpdk-socket-mem value. Provide as a comma-separated list. The OvsDpdkSocketMemory value is calculated from the MTU value of each NIC on the NUMA node. 800 is the overhead value. 4096 * 64 is the number of packets in the mempool. Add the MEMORY_REQD_PER_MTU for each of the MTU values set on the NUMA node and add another 512 MB as buffer. Round the value up to a multiple of 1024. Round off the MTU values to the nearest 1024 bytes. The MTU value of 9000 becomes 9216 bytes. The MTU value of 2000 becomes 2048 bytes. Calculate the required memory for each MTU value based on these rounded byte values. Calculate the combined total memory required, in bytes. 2625634304 + 746586112 + 536870912 = 3909091328 bytes. This calculation represents (Memory required for MTU of 9000) + (Memory required for MTU of 2000) + (512 MB buffer). Convert the total memory required into MB. 3909091328 / (1024*1024) = 3728 MB. Round this value up to the nearest 1024. 3724 MB rounds up to 4096 MB. Use this value to set OvsDpdkSocketMemory. 746586112 + 536870912 = 1283457024 bytes. This calculation represents (Memory required for MTU of 2000) + (512 MB buffer). 1283457024 / (1024*1024) = 1224 MB. 1224 MB rounds up to 2048 MB. Sets the driver type used by DPDK. Use the default of vfio-pci. Datapath type for OVS bridges. DPDK uses the default value of netdev. Sets the vhost-user socket directory for OVS. Use /var/lib/vhost_sockets for vhost client mode. Provides an ordered list of filters that the Compute node uses to find a matching Compute node for a requested guest instance. hugepagesz: Sets the size of the huge pages on a CPU. This value can vary depending on the CPU hardware. Set to 1G for OVS-DPDK deployments (default_hugepagesz=1GB hugepagesz=1G). Check for the pdpe1gb CPU flag to ensure your CPU supports 1G. hugepages count: Sets the number of huge pages available. This value depends on the amount of host memory available. Use most of your available memory (excluding NovaReservedHostMemory). You must also configure the huge pages count value within the OpenStack flavor associated with your Compute nodes. isolcpus: Sets the CPU cores to be tuned. This value matches IsolCpusList. NUMA 1 has cores 8-15. The sibling thread pairs are (8,9), (10,11), (12,13), and (14,15). Each NUMA node connects to a physical NIC (NIC1 on NUMA 0 and NIC2 on NUMA 1). Reserve the first physical cores (both thread pairs) on each NUMA node (0,1 and 8,9) for non data path DPDK processes (OvsDpdkCoreList). Red Hat recommends using 1 physical core per NUMA node. This sample OVS-DPDK deployment consists of two VNFs each with two interfaces, namely, the management interface represented by mgt and the data plane interface. In the OVS-DPDK deployment, the VNFs run with inbuilt DPDK that supports the physical interface. OVS-DPDK takes care of the bonding at the vSwitch level. In an OVS-DPDK deployment, it is recommended that you do not mix kernel and OVS-DPDK NICs as it can lead to performance degradation. 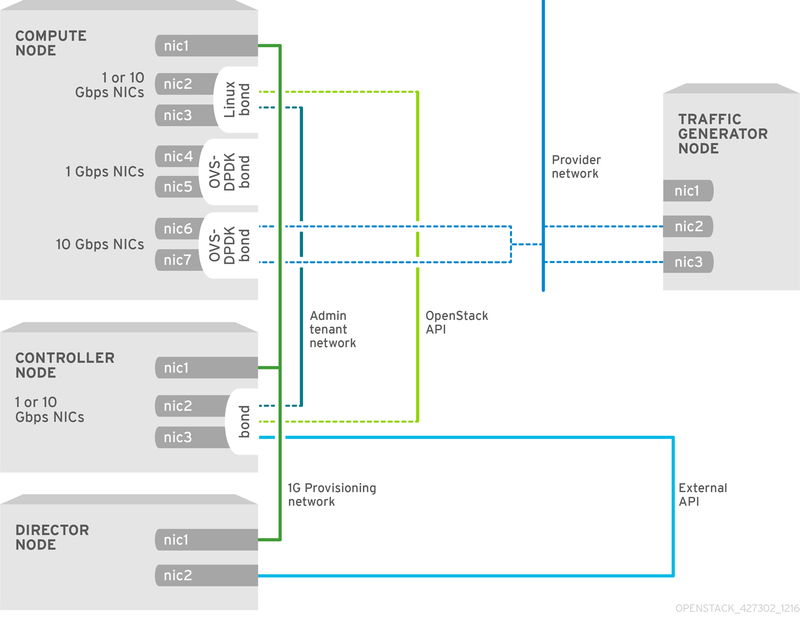 To separate the management (mgt) network, connected to the Base provider network for the virtual machine, you need to ensure you have additional NICs. The Compute node consists of two regular NICs for the OpenStack API management that can be reused by the Ceph API but cannot be shared with any OpenStack tenant. The following image shows the topology for OVS_DPDK for the NFV use case. It consists of Compute and Controller nodes with 1 or 10 Gbps NICs, and the Director node. This section deploys DPDK with Open vSwitch (OVS-DPDK) within the Red Hat OpenStack Platform environment. 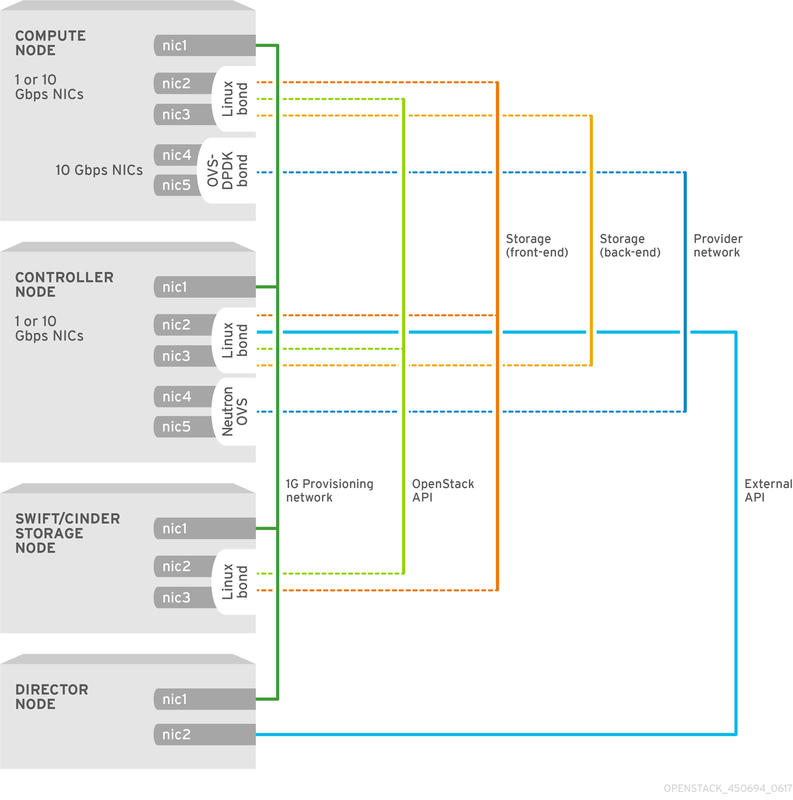 The overcloud usually consists of nodes in predefined roles such as Controller nodes, Compute nodes, and different storage node types. Each of these default roles contains a set of services defined in the core Heat templates on the director node. You must install and configure the undercloud before you can deploy the overcloud. See the Director Installation and Usage Guide for details. You must determine the best values for the OVS-DPDK parameters that you set in the network-environment.yaml file to optimize your OpenStack network for OVS-DPDK. Do not edit or change isolated_cores or other values in etc/tuned/cpu-partitioning-variables.conf that are modified by these director Heat templates. See Section 7.2, “Overview of workflows and derived parameters” for an overview of the Mistral workflow for DPDK. You must have Bare Metal introspection, including hardware inspection extras (inspection_extras) enabled to provide the data retrieved by this workflow. Hardware inspection extras are enabled by default. See Inspecting the Hardware of Nodes. This input parameter specifies the required minimum number of cores for the NUMA node associated with the DPDK NIC. One physical core is assigned for the other NUMA nodes not associated with DPDK NIC. Ensure that this parameter is set to 1. This input parameter specifies the required percentage of total memory (excluding NovaReservedHostMemory) that can be configured as huge pages. The KernelArgs parameter is derived using the calculated huge pages based on the huge_page_allocation_percentage specified. Ensure that this parameter is set to 50. The workflows use these input parameters along with the bare-metal introspection details to calculate appropriate DPDK parameter values. Copy the usr/share/openstack-tripleo-heat-templates/plan-samples/plan-environment-derived-params.yaml file to a local directory and set the input parameters to suit your environment. # will be used, else 1. # specified percentage of the remaining is configured as huge pages. Deploy the overcloud with the update-plan-only parameter to calculate the derived parameters. The output of this command shows the derived results, which are also merged into the plan-environment.yaml file. Waiting for messages on queue 472a4180-e91b-4f9e-bd4c-1fbdfbcf414f with no timeout. The OvsDpdkMemoryChannels parameter cannot be derived from introspection details. In most cases, this value should be 4. Copy the derived parameters from the deploy command output to the network-environment.yaml file. You must assign at least one CPU (with sibling thread) on each NUMA node with or without DPDK NICs present for DPDK PMD to avoid failures in creating guest instances. These parameters apply to the specific role (ComputeOvsDpdk). You can apply these parameters globally, but any global parameters are overwritten by role-specific parameters. In a cluster with Compute, ComputeOvsDpdk, and ComputeSriov, the existing derive parameters workflow applies the formula for the ComputeOvsDpdk role only. With Red Hat OpenStack Platform, you can create custom deployment roles, using the composable roles feature, adding or removing services from each role. For more information on Composable Roles, see Composable Roles and Services. If you use composable roles, copy and modify the roles_data.yaml file to add the custom role for OVS-DPDK. Update the appropriate network-environment.yaml file to include parameters for kernel arguments and DPDK arguments. Update the compute.yaml file to include the bridge for DPDK interface parameters. Update the controller.yaml file to include the same bridge details for DPDK interface parameters. Run the overcloud_deploy.sh script to deploy the overcloud with the DPDK parameters. This guide provides examples for CPU assignments, memory allocation, and NIC configurations that can vary from your topology and use case. See the Network Functions Virtualization Product Guide and Chapter 2, Hardware requirements to understand the hardware and configuration options. Tested NIC. For a list of tested NICs for NFV, see Section 2.1, “Tested NICs”. The Red Hat OpenStack Platform operates in OVS client mode for OVS-DPDK deployments. Set the global MTU value for networking in the network-environment.yaml file. Set the physical DPDK port MTU value in the compute.yaml file. This value is also used by the vhost user interface. Set the MTU value within any guest instances on the Compute node to ensure that you have a comparable MTU value from end to end in your configuration. VXLAN packets include an extra 50 bytes in the header. Calculate your MTU requirements based on these additional header bytes. For example, an MTU value of 9000 means the VXLAN tunnel MTU value is 8950 to account for these extra bytes. You do not need any special configuration for the physical NIC because the NIC is controlled by the DPDK PMD and has the same MTU value set by the compute.yaml file. You cannot set an MTU value larger than the maximum value supported by the physical NIC. Set the NeutronGlobalPhysnetMtu parameter in the network-environment.yaml file. Ensure that the NeutronDpdkSocketMemory value in the network-environment.yaml file is large enough to support jumbo frames. See Section 7.4.2, “Memory parameters” for details. Set the MTU value on the bridge to the Compute node in the controller.yaml file. Dataplane interfaces need a high degree of performance in a stateful firewall. To protect these interfaces, consider deploying a telco grade firewall (VNF). Controlplane interfaces can be configured by setting the NeutronOVSFirewallDriver parameter openvswitch. This configures OpenStack Networking to use the flow-based OVS firewall driver. This is set in the network-environment.yaml file under parameter_defaults. When the OVS firewall driver is used, it is important to disable it for dataplane interfaces. This can be done with the openstack port set command. Use Linux bonds for control plane networks. Ensure that both PCI devices used in the bond are on the same NUMA node for optimum performance. Neutron Linux bridge configuration is not supported by Red Hat. Huge pages are required for every instance running on the hosts with OVS-DPDK. If huge pages are not present in the guest, the interface appears but does not function. With OVS-DPDK, there is a performance degradation of services that use tap devices, such as Distributed Virtual Routing (DVR), Firewall-as-a-Service (FWaaS), and Loadbalancing-as-a-Service (LBaaS). You can enable DVR with netdev datapath, but the resulting performance is not suitable for a production environment. When using OVS-DPDK, all bridges on the same Compute node must be of type ovs_user_bridge. The director may accept the configuration, but Red Hat OpenStack Platform does not support mixing ovs_bridge and ovs_user_bridge on the same node. Create an aggregate group and add relevant hosts for OVS-DPDK. Define metadata, for example dpdk=true, that matches defined flavor metadata. Use host aggregates to separate CPU pinned instances from unpinned instances. Instances that do not use CPU pinning do not respect the resourcing requirements of instances that use CPU pinning. Set additional flavor properties. Note that the defined metadata, dpdk=true, matches the defined metadata in the DPDK aggregate. In this example, m1.medium_huge_4cpu is the flavor name and the remaining parameters set the other properties for the flavor. See Configure Emulator Threads to run on a Dedicated Physical CPU for details on the emulator threads policy for performance improvements. This section describes the steps to troubleshoot the DPDK-OVS configuration. Review the bridge configuration and confirm that the bridge was created with the datapath_type=netdev. Review the OVS service by confirming that the neutron-ovs-agent is configured to start automatically. If the service does not start, you can view any related messages. Confirm that the PMD CPU mask of the ovs-dpdk are pinned to the CPUs. In case of HT, use sibling CPUs. Emulator threads handle interrupt requests and non-blocking processes for virtual machine hardware emulation. These threads float across the vCPUs that the guest uses for processing. If threads used for the poll mode driver (PMD) or real-time processing run on these vCPUs, you can experience packet loss or missed deadlines. You can separate emulator threads from VM processing tasks by pinning the threads to their own vCPUs, increasing performance as a result. To improve performance, reserve a subset of pCPUs for hosting emulator threads. Red Hat recommends using pCPUs identified in the OvsDpdkCoreList paramenter. Deploy an overcloud with NovaComputeCpuSharedSet defined for a given role. The value of NovaComputeCpuSharedSet applies to the cpu_shared_set parameter in the nova.conf file for hosts within that role. Create a flavor to build instances with emulator threads separated into a shared pool. Add the hw:emulator_threads_policy extra specfication, and set the value to share. Instances created with this flavor will use the vCPUs defined in the cpu_share_set parameter in the nova.conf file. You must set the cpu_share_set parameter in the nova.conf file manually or with Heat to enable the share policy for this extra specification. Identify the host for a given instance and the name of the instance. Use SSH to log onto the identified host as heat-admin. This section describes the steps to install and configure Red Hat Enterprise Linux 7.5 Real Time KVM (RT-KVM) for the Red Hat OpenStack Platform. Red Hat OpenStack Platform provides real-time capabilities with a new Real-time Compute node role that provisions Red Hat Enterprise Linux for Real-Time, as well as the additional RT-KVM kernel module, and automatic configuration of the Compute node. You must use Red Hat certified servers for your RT-KVM Compute nodes. See Red Hat Enterprise Linux for Real Time 7 certified servers for details. See Registering and updating your undercloud for details on how to enable the rhel-7-server-nfv-rpms repository for RT-KVM. You need a separate subscription to a Red Hat OpenStack Platform for Real Time SKU before you can access this repository. Use the following steps to build the overcloud image for Real-time Compute nodes. Register your image to enable Red Hat repositories relevant to your customizations. Replace [username] and [password] with valid credentials in the following example. Remove credentials from the history file anytime they are used on the command prompt. You can delete individual lines in history using the history -d command following the line number. Find a list of pool IDs from your account’s subscriptions, and attach the appropriate pool ID to your image. Add repositories necessary for Red Hat OpenStack Platform with NFV. Create a script to configure real-time capabilities on the image. You can check that the packages installed using the rt.sh script installed correctly by examining the virt-customize.log file that was created from the previous command. The software version in the vmlinuz and initramfs filenames vary with the kernel version. Use the relevant software version in the filename, for example image/boot/vmlinuz-3.10.0-862.rt56.804.el7x86_64, or use the wildcard symbol * instead. You now have a real-time image you can use with the ComputeOvsDpdkRT composable role on your selected Compute nodes. See Setting BIOS parameters for descriptions of these settings and the impact of disabling them. See your hardware manufacturer documentation for complete details on how to change BIOS settings. You must determine the best values for the OVS-DPDK parameters that you set in the network-environment.yaml file to optimize your OpenStack network for OVS-DPDK. See Section 8.1, “Deriving DPDK parameters with workflows” for details. You use the ComputeOvsDpdkRT role to specify Compute nodes that use the real-time compute image. Generate roles_data.yaml for the ComputeOvsDpdkRT role. # Specify the relative/absolute path to the config files you want to use for override the default. KernelArgs: "default_hugepagesz=1GB hugepagesz=1G hugepages=32 iommu=pt intel_iommu=on isolcpus=1-7,17-23,9-15,25-31"
You must assign at least one CPU (with sibling thread) on each NUMA node with or without DPDK NICs present for DPDK PMD to avoid failures in creating guest instances. This is shown in the example through the OvsPmdCoreList parameter. These huge pages are consumed by the virtual machines, and also by OVS-DPDK using the OvsDpdkSocketMemory parameter as shown in this procedure. The number of huge pages available for the virtual machines is the boot parameter minus the OvsDpdkSocketMemory. You must also add hw:mem_page_size=1GB to the flavor you associate with the DPDK instance. OvsDPDKCoreList and OvsDpdkMemoryChannels are the required settings for this procedure. Attempting to deploy DPDK without appropriate values causes the deployment to fail or lead to unstable deployments. 9.2.2.3. Preparing the container images. You can configure physical functions (PFs) to trust virtual functions (VFs) so that VFs can perform some privileged actions. For example, you can use this configuration to allow VFs to enable promiscuous mode or to change a hardware address. Add the NeutronPhysicalDevMappings parameter under the parameter_defaults section to make the link between the logical network name and the physical interface. Add the new property "trusted" to the existing parameters related to SR-IOV. You must include quotation marks around the value "true". Complete the following step only in trusted environments. This step will allow non-administrative accounts the ability to bind trusted ports. Modify permissions to allow users the capability of creating and updating port bindings. Execute the following on a fully deployed overcloud to utilize trusted virtual functions. Create a network of type vlan. Create a port, setting the vnic-type option to direct, and the binding-profile option to true. Create an instance binding it to the previously created trusted port. View the output of the ip link command and verify that the trust status of the virtual function is trust on. The example output contains details of an environment that contains two ports. Note that vf 6 contains the text trust on. To prevent packet loss, increase the queue size from the default of 256 to a maximum of 1024. To configure RX, ensure that you have libvirt v2.3 and QEMU v2.7. To configure TX, ensure that you have libvirt v3.7 and QEMU v2.10. You can check the values for RX queue size and TX queue size in the VM instance XML file generated by libvirt on the compute host. You can check for improved performance, such as 3.8 mpps/core at 0 frame loss. The correct use of this feature starts with hardware procurement and appropriate auditing of hardware configuration. The number of physical networks as well as PCI card placement and physical architecture of existing servers will all affect a well planned implementation of this feature. Memory-mapped I/O (MMIO) devices like PCIe NICs are associated with specific NUMA nodes. When a VM and the NIC are not on the same NUMA node, you can observe a significant decrease in performance. Performance advantages are realized by aligning PCIe NIC placement and instance processing on a common NUMA node. When utilizing this feature, all instances associated with a given physnet will be spawned on a common NUMA node. Additionally, if this physnet is the only network access provided for all VMs, the end result may be under utilization of datacenter hardware. Load sharing VM threads can be accomplish through the use of multiple networks, network types or bonding. To correctly architect NUMA-node load sharing and network access, knowledge of PCIe slot to NUMA-node mapping will be required. For detailed information on your specific hardware, refer to your vendor’s documentation. To prevent a cross-NUMA configuration, place the VM on the correct NUMA node, by providing the location of the NIC to Nova. Set a new NeutronPhysnetNUMANodesMapping parameter to map the physical network to the NUMA node that you associate with the physical network. If you use tunnels, such as VxLAN or GRE, you must also set the NeutronTunnelNUMANodes parameter. This section describes how to deploy Compute nodes with both OVS-DPDK and SR-IOV interfaces. The cluster installs with ML2/OVS and VXLAN tunnelling. You must determine the best values for the OVS-DPDK parameters that you set in the network-environment.yaml file to optimize your OpenStack network for OVS-DPDK. See Deriving DPDK parameters with workflows for details. Red Hat OpenStack Platform provides a set of default roles in the roles_data.yaml file. You can create your own roles_data.yaml file to support the roles you require. For the purposes of this example, the ComputeOvsDpdkSriov role is created. For information on creating roles in Red Hat OpenStack Platform, see Advanced Overcloud Customization. For details on the specific role used for this example, see roles_data.yaml. You must determine the best values for the OVS-DPDK parameters that you set in the network-environment.yaml file to optimize your OpenStack network for OVS-DPDK. See https://access.redhat.com/documentation/en-us/red_hat_openstack_platform/14/html/network_functions_virtualization_planning_and_configuration_guide/part-dpdk-configure#proc_derive-dpdk for details. # The OVS logical->physical bridge mappings to use. KernelArgs: "default_hugepagesz=1GB hugepagesz=1G hugepages=32 iommu=pt intel_iommu=on isolcpus=2-19,22-39"
You must assign at least one CPU (with sibling thread) on each NUMA node with or without DPDK NICs present for DPDK PMD to avoid failures in creating guest instances. This is expressed in the example through the OvsPmdCoreList parameter, having cores 2 and 22 from NUMA 1, and having cores 3 and 23 from NUMA 2. Create the control plane Linux bond for an isolated network. Assign VLANs to this Linux bond. Create the OVS bridge for access to neutron-dhcp-agent and neutron-metadata-agent services. Set a bridge with a DPDK port to link to the controller. To include multiple DPDK devices, repeat the type code section for each DPDK device that you want to add. Run the overcloud_deploy.sh script to deploy the overcloud. There are additional considerations and steps required to upgrade Red Hat OpenStack Platform when you have OVS-DPDK configured. 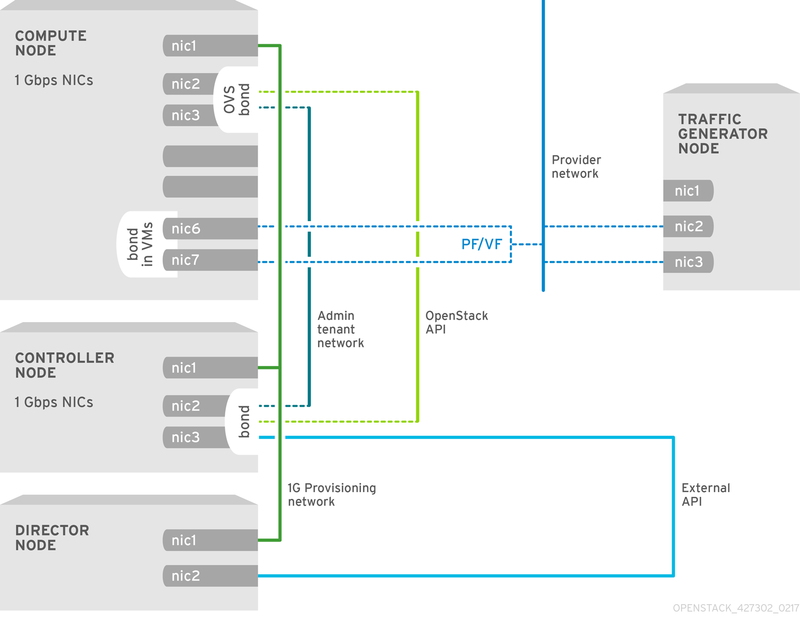 The steps are covered in Preparing an NFV-Configured Overcloud. Red Hat OpenStack Platform director configures the Compute nodes to enforce resource partitioning and fine tuning to achieve line rate performance for the guest VNFs. The key performance factors in the NFV use case are throughput, latency, and jitter. You can enable high performance packet switching between physical NICs and virtual machines using DPDK-accelerated virtual machines. OVS 2.10 embeds support for DPDK 17 and includes support for vhost-user multiqueue, allowing scalable performance. OVS-DPDK provides line rate performance for guest VNFs. SR-IOV networking provides enhanced performance characteristics, including improved throughput for specific networks and virtual machines. Other important features for performance tuning include huge pages, NUMA alignment, host isolation, and CPU pinning. VNF flavors require huge pages and emulator thread isolation for better performance. Host isolation and CPU pinning improve NFV performance and prevent spurious packet loss. See NFV Performance Considerations and Configure Emulator Threads to run on a Dedicated Physical CPU for a high-level introduction to CPUs and NUMA topology. Red Hat OpenStack Platform is supported on Red Hat Enterprise Linux 7.5. For information on installing Red Hat Enterprise Linux, see the corresponding installation guide at: Red Hat Enterprise Linux Documentation Suite. To install OpenStack components and their dependencies, use the Red Hat OpenStack Platform director. The director uses a basic OpenStack installation as the undercloud to install, configure, and manage the OpenStack nodes in the final overcloud. You need one extra host machine for the installation of the undercloud, in addition to the environment necessary for the deployed overcloud. For detailed instructions, see Red Hat OpenStack Platform Director Installation and Usage. For information on configuring advanced features for a Red Hat OpenStack Platform enterprise environment using the Red Hat OpenStack Platform director such as network isolation, storage configuration, SSL communication, and general configuration method, see Advanced Overcloud Customization. For a high level overview of the NFV concepts, see the Network Functions Virtualization Product Guide. This section provides sample DPDK SRIOV hybrid files as a reference. Database, Messaging and Network functions. # Set uses_deprecated_params to True if any deprecated params are used. # The tunnel type for the tenant network (vxlan or gre). Set to '' to disable tunneling. # The tenant network type for Neutron (vlan or vxlan). # The Neutron ML2 and OpenVSwitch vlan mapping range to support. # Nova flavor to use. # Number of nodes to deploy. # Configure the classname of the firewall driver to use for implementing security groups. Routes for the external network traffic. from the subnet host_routes attribute. Routes for the internal_api network traffic. Routes for the storage network traffic. Routes for the storage_mgmt network traffic. Routes for the tenant network traffic. Routes for the management network traffic. lacp=active and/or bond_mode=balance-slb using this option. description: Vlan ID for the storage_mgmt network traffic. DNS servers to use for the Overcloud (2 max for some implementations). dns_nameservers attribute will be used.